Thank you for reading the DDO Chronicle! 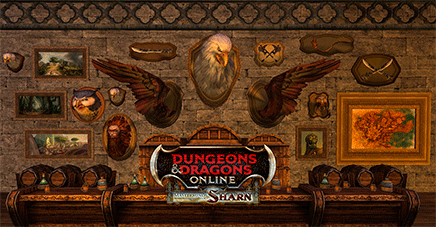 Don't forget to reply below to the Chronicle Comment for your chance to win 500 DDO Points. We'll select a random winner after Noon Eastern on Thursday, January 31st. Good luck! I'd shift my weight from side to side until it tips over and hopefully shatters. If not, then I have to figure out how to free myself from an iceblock while lying down. As a druid, just turn into a fire elemental. Hire a good divorce lawyer. or start chipping away to make an ice sculpture with "hilarious" additions, before eventually breaking me out. I can't think of anything clever to say. So I guess I would just have to wait for it to melt. I would just use my Harper Pin, and the ice should shatter freeing me. I can't think of anything clever, either, because all I got is 'Scotch on the rocks'. So I can't be clever, but at least I can be drunk. Assume druid fire elemental form. "Observe the ancient cave dweller frozen in ice." "I do not recall seeing one so red colored? A new species of cave dweller, perhaps?" "It appears to be the same color as boiled lobster. Most unusual." Chew at it till I can free an arm, then smash it. (Yes, I chew ice chips IRL).